With esthetic salons and beauty clinics, you can easily experience the professional pack used for aging care at home. Beauty ingredients · Placenta extract, hyaluronic acid, collagen blended in luxury. Furthermore whitening ingredient · Everchel White tightens the skin and improves trouble skin. It leads to clear skin with transparency. The unique gel process (Botanical Moisture gel structure) sustains the pack effect, and carbon dioxide gas and beauty ingredients firmly penetrate the skin. 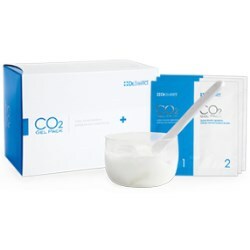 Easy home esest with CO2 gel pack to peel! Expanding foaming time by our own gel manufacturing method!